The information revolution has been changing the world profoundly and irreversibly for some time now, at a breathtaking pace, and with an unprecedented scope, making the creation, management, and utilisation of information vital issues. Such revolution has brought enormous benefits and opportunities. However, it has also greatly outpaced our understanding of its foundations and consequences, and raised conceptual issues that are rapidly expanding, evolving, and becoming increasingly serious. Today, philosophy faces the challenge of providing a foundational treatment of the concepts and phenomena underlying the information revolution, in order to foster our understanding and guide the responsible construction of our information society. The is a challenge met by the philosophy of information. The philosophy of information investigates the conceptual nature and basic principles of information, including its ethical consequences. It analyses problems in order to design solutions. It is a thriving new area of research, at the crossroads of epistemology, metaphysics, logic, philosophy of science, semantics, and ethics. 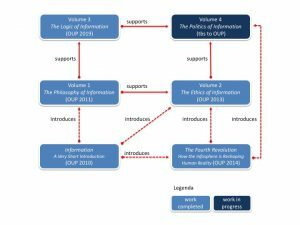 I have been working on developing the philosophy of information as a new and independent area of research since the late nineties. The general view orienting my work is that information is a concept as fundamental and important as truth, meaning, knowledge, Being, or good and evil – all pivotal concepts – and so equally worthy of autonomous, philosophical investigation. It is also a more impoverished concept, in terms of which the others can be expressed, interrelated, and investigated philosophically. Through the years, my research on the nature, dynamics, and uses of information has led to a tetralogy on The Foundations of the Philosophy of Information (Principia Philosophiae Informationis), which is now being published by Oxford University Press. The map shows how my Books are related to each other.